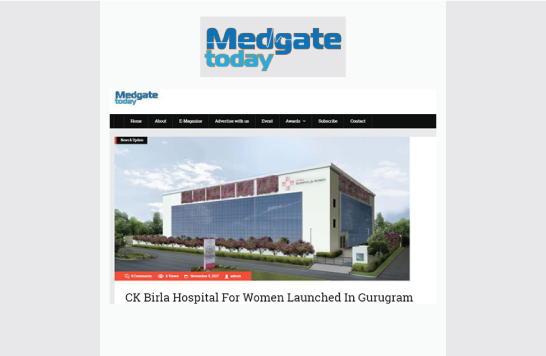 The CK Birla Group, a diversified business conglomerate with a 150-year-old legacy, launched the CK Birla Hospital for Women in Gurugram, Haryana. This new venture under the Group is aimed at creating a healthcare system for women in India, which has a professional and transparent approach and lays emphasis on providing world-class service with warmth, responsiveness and sensitivity. The hospital’s state-of-the-art facilities provide women access to clinical care of international standards. To achieve outstanding clinical outcomes, the hospital has partnered with the most respected Institutions and practitioners around the world to establish international best practices. The team has been mentored by world-renowned medical experts across the UK, USA and India. The hospital spread over 78,000 sq. ft., is a 70-bed facility with ICUs, a 15-bed level 3 NICU, 5 operating theatres, 38 spacious patient rooms and suites with all amenities, outpatient rooms, advanced labour and recovery rooms, state-of-the-art diagnostics, an advanced IVF unit with a modular egg collection theatre, andrology lab, IVF lab, IUI/embryo transfer facility and a cryo store. The clinical facilities include 24×7 diagnostics, pathology and radiology with an outpatient pharmacy and doorstep delivery of all pharmacy products. The critical care team includes 24×7 anaesthetists, intensivists as well as neonatologists who provide cover for the adult and neonatal ICU.